Wally is a writer for stage and screen; he writes comedy and comedy/drama – as well as drama. A graduate of Soho Theatre’s Young Writer’s Group, he has previously had work performed at Soho Theatre, Theatre Royal Stratford East, Trafalgar Studios, and The Albany Theatre. 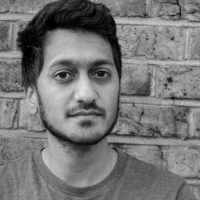 In 2014 he did the Channel 4 Screenwriting Course for which he wrote a pilot for a drama series, RASHEED/RASHEED which won the BAFTA Rocliffe New Writing Prize for TV Drama in 2016. He was also a shortlisted finalist for BBC All Mixed Up sitcom competition in 2010. His essay, GLASS WINDOWS AND GLASS CEILINGS, is included in a collection of ‘essays on the working class, by the working class’ called Know Your Place, published by Dead Ink Books 2017. Currently he is developing two projects for BBC Studios, comedy drama FRIENDS & BENEFITS and an adaptation of Riaz Khan’s hard-hitting autobiographical MEMOIRS OF AN ASIAN FOOTBALL CASUAL. His comedy/drama, WALKING, is in development with Silverprint (ITV Studios) and DIRTY MAHMOOD is development with Wall To Wall.